Daily flights land at Annai, two hours south of Iwokrama by road. Charter flights can land at Fair View, 2km from our location. Guyana’s trans-national road passes directly through the Iwokrama Rain Forest and provides ground access to both Georgetown and Lethem. Rough and unpredictable roads are either a hindrance or an adventure! An unpaved road stretches from Georgetown on Guyana’s Atlantic coastline to Lethem on the Brazil border. 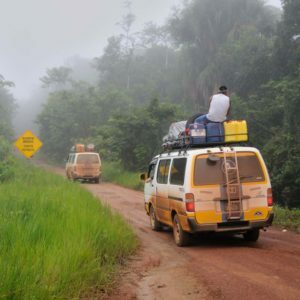 The laterite highway is a lifeline for Guyana’s interior communities. The transnational highway is a lifeline but suffers from occasional washouts and severe rutting which can dramatically lengthen the time it takes to cover even short distances. Very few private vehicles make the journey, and coach service was suspended in 2011. 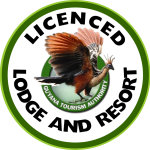 Georgetown to Iwokrama in an Iwokrama Vehicle: Depart from Iwokrama’s office in Georgetown in a 4×4 air conditioned vehicle with an experienced driver. Along the way your guide will point out unique and interesting wildlife, fauna and flora. Stop for lunch at 58 miles Mabura where a traditional Guyanese meal and refreshment can be enjoyed. The duration of this trip is approximately 6 – 9 hours each way depending on road conditions. Suitable vehicles are used for larger groups. See our rates page for additional details. Georgetown to Iwokrama via public minibus: Make your own arrangements for ground transport. This minibus departs Georgetown at approximately 6pm and travels through the night making one or two convenience stops en-route. You’ll arrive at Kurupukari Crossing on the Essequibo River by 6 am when ferry service commences. Our vehicle will uplift you from the Radio Station (RS1) cottage after you’ve crossed the river. Call P & A Bus Service in Georgetown on Tel:(+592) 225 5058. See our rates page for additional details. Flying to Iwokrama is a more comfortable journey and you are far more likely to arrive on schedule. 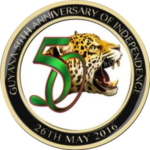 Trans Guyana Airways (TGA) makes several flights daily between Georgetown and Lethem. With special arrangements, TGA will stop briefly at the Annai or Surama airstrip mid-flight. From there, our vehicle will drive you to Iwokrama, a journey of approximately 2 hours. Vehicles in this region are in very short supply, so ground transport must be pre-arranged well in advance. Some travellers – especially groups of 6 or more – may wish to charter a flight from Georgetown to Fairview airstrip, only 2 km from the Iwokrama River Lodge. This can be particularly convenient and cost effective if you stop at Kaieteur Falls along the way and factor in the ground transport savings.See our rates page for additional details. 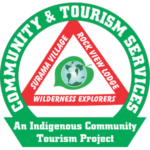 The Canopy Walkway and Atta Rainforest Lodge are jointly operated by Surama Village, Rock View Lodge, Iwokrama International Center for Rainforest Conservation, and Wilderness Explorers. Perched 33 meters (100 feet) above the forest floor, the walkway’s four spacious platforms give visitors a unique perspective impossible to gain from the ground below. 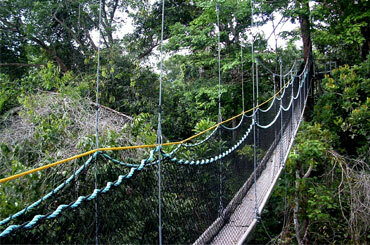 Many of Guyana’s 840+ species are on unique display here at the Canopy Walkway. 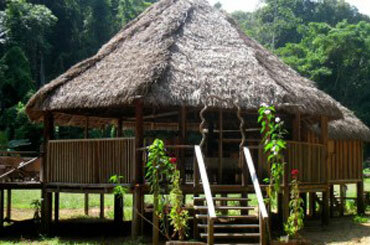 The Eco Lodge—plus tours in and around Surama—are managed and operated solely by the Makushi. More than 70 people are employed either directly as hospitality staff, guides, cooks, artisans and drivers…or indirectly as farmers, hunters, fishermen, and construction and maintenance workers. Roughly 60% of the community’s income is now sustainably generated through tourism-related activities. 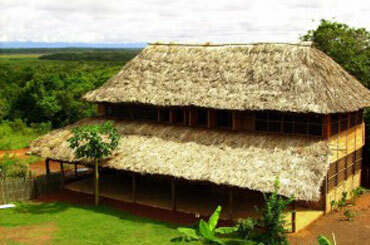 Nestled between the Amerindian villages of Annai and Rupertee where the Pakaraima foothills meet the tropical rainforest, Rock View Lodge offers comfortable lodging, outdoor and cultural activities, authentic Amerindian hospitality, and access to everything else that central Guyana has to offer. 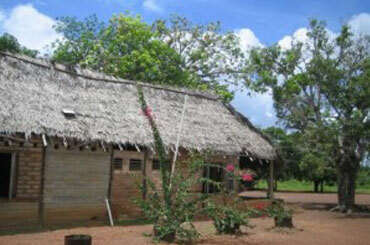 Rewa village is a small Amerindian community located in the north Rupununi in central Guyana, at the confluence of the Rewa and Rupununi rivers. With about 300 inhabitants, the people of Rewa village are mostly from the Makushi tribe. The Rewa area is renowned for its abundance of wildlife and ecological diversity. 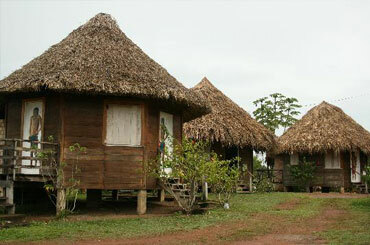 The eco-lodge was started in 2005 with a community grant provided by Conservation International. Karanambu is a birdwatcher’s paradise. 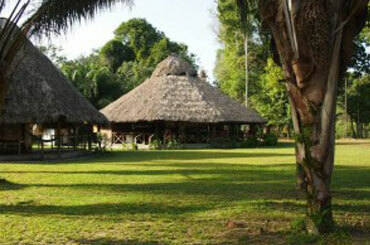 The Lodge also provides excellent viewing opportunities of giant river otters, giant black caiman and giant anteaters. The evening ritual of watching the giant water lily, Victoria amazonica, open is a memorable experience. Karanambu is also the home of Diane McTurk, conservationist and world-renowned expert on giant otters. 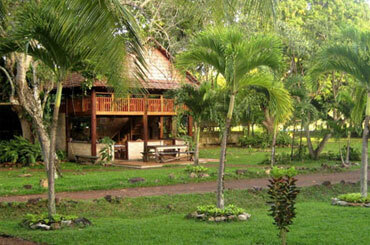 Maipaima EcoLodge is nestled amidst the towering rainforests in the Kanuku foothills of central Guyana. A community-run project of Nappi Village, the EcoLodge is a secluded gem that warmly welcomes a select few visitors each year. Unspoiled nature, rich wildlife, a dizzying array of birds, and a chance to see the rarely-visited Jordan Falls make all the effort to get there worthwhile. Caiman House, a joint venture with Rupununi Learners and Yupukari Village, offers guests the chance to observe caiman trapping for research and to support numerous educational projects in the area. The storied ranch south of our village is a great jumping-off point for river and trekking excursions, and a favorite spot for birders seeking Guyana’s rarest species. 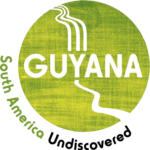 Our mission is to promote conservation and the sustainable and equitable use of tropical rainforests in a manner that will lead to lasting ecological, economic and social benefits to the people of Guyana and to the world in general by undertaking research, training and the development and dissemination of technologies. Learn more about our work at iwokrama.org. I cannot say enough about this experience. We were the only guests at the place, and the staff made us feel more than welcome. 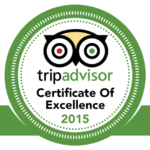 The staff were very friendly and did everything possible to make our stay an enjoyable one. The most amazing place I've ever stayed, the setting is incredible. Definitely recommended. 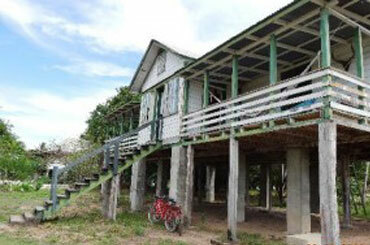 The accommodations were the best we stayed in anywhere in Guyana. You must hike up Turtle mountain, it centers you, reminds you of what's important in this life.